It happens so often that it has now become a general principle. The weather improves the day after you really need good weather. So today the weather was perfect, not too hot and a strong overnight wind had blown all the humidity away. Really needed today's clear weather yesterday when I was climbing up vantage points and had the big views. Today's walk to Nagyvazsony was nice but much shorter than yesterday and not as dramatic. Leaving Szentbekkalla at about 9.30 the wind was still blowing and it was actually cool. Immediately to the north of the village the signs said go left and my GPS trail said go right. Going right involved passing a man in a tower shooting at things so I turned off the GPS and went left. Climbing up the hill went past a remote house with a naked couple in the garden and washing themselves with a water pipe. Crept quietly past as anything else felt like an intrusion. On top of the hill was a wooden watchtower, three or four flights of stairs high and with views above the trees. 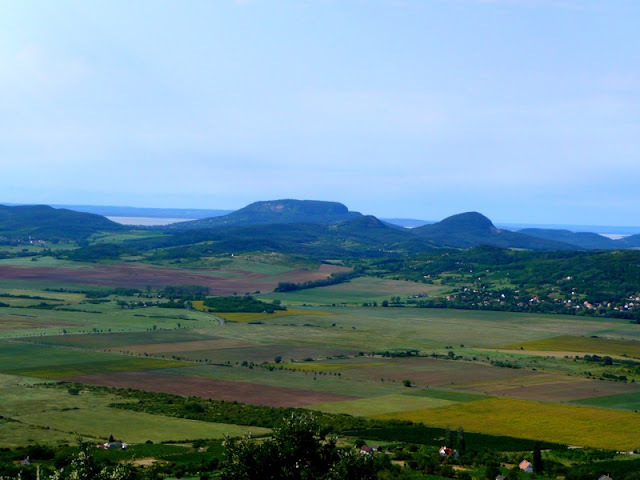 Great views of Lake Balaton in between the hills to the south and in the picture below the central hill (can't work out what it's called from the map) is the hill I climbed just after midday yesterday. By now the sun had come out again but it's not hot nearly as it has been. Stopped in a bar in Balatonhenye for a drink of lemonade and walked on through a mix of open countryside and forest towards Nagyvazsony. The agriculture seems less intensive in this part of Hungary than it was last week, not so many huge fields designed for huge machines. 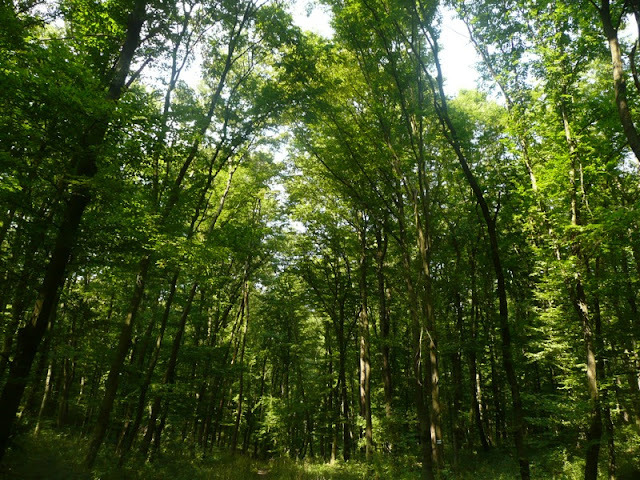 The forest walks were very similar - really pleasant. So got to Nagyvazsony at about 2.30 after 21 very easy kilometres. Given the perfect weather conditions was tempted to carry on but I'm running out of map and couldn't find a petrol station to buy the next one. The most likely reason I put a short day in the schedule is that I couldn't find anywhere to stay at in a reasonable distance further along the trail. As it is I have a 44 kilometre walk tomorrow. Nagyvazsony is actually a very pleasant village. 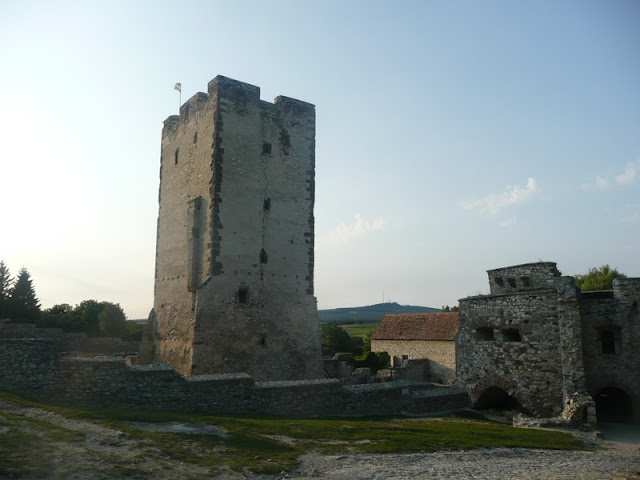 It has a 15th century castle and a museum charting the development of the post office. Good opportunity to rest up before the start of last full week of walking. 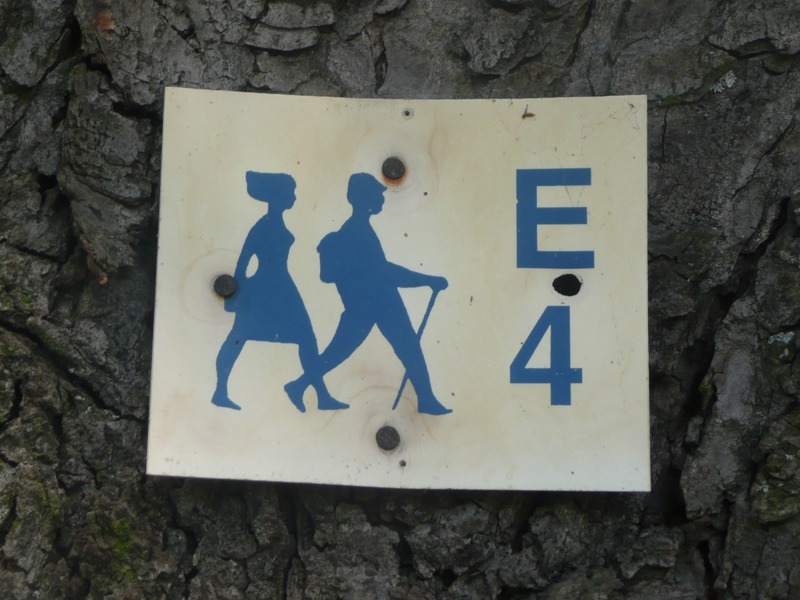 There is particularly distinct sign for the E4 which has started to crop up, have only seen it in Hungary. It's a sort of cross between the television series "Madmen" and the film "Sound of Music" - is that at "A line" dress?.